The slang term "square" used to mean "boring," but the Fujifilm Instax SQ6 turns conventional wisdom on its head. It prints 1:1 square-format instant photos that create keepsakes of memorable people and events in your life. The camera itself is a nearly square work of art that comes in three fashionable colors: Blush Gold, Graphite Gray, or Pearl White. 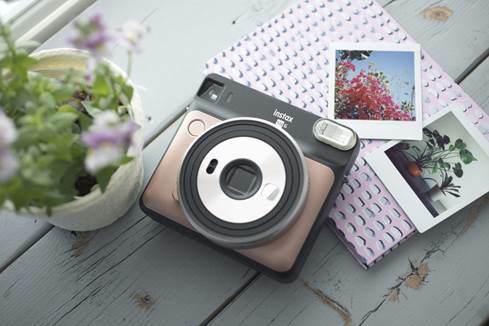 The Fujifilm Instax SQ6 is a stylish camera that prints instant photos of cherished moments. You can always leave the camera on auto and let it help you take great photos. But there are also a few built-in shooting modes you can use in certain situations. Macro mode lets you get up close and personal to capture details. Landscape mode takes in more of the beautiful vista in front of you. Double exposure gives you a creative way to blend two images into one. And there's a selfie mode to make sure you look your best in portraits. 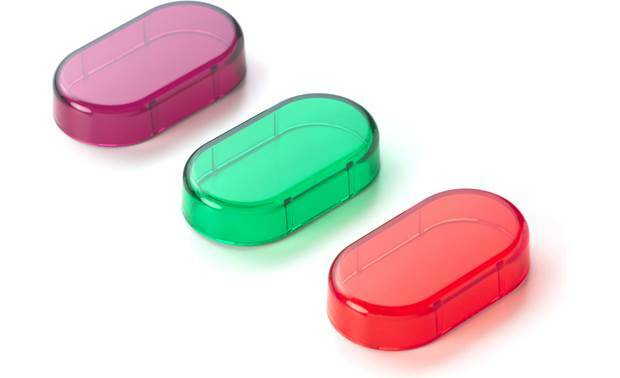 Three flash color filters are included. Just pop on an orange, purple, or green filter, and add some ultra-cool ambiance to any photo. 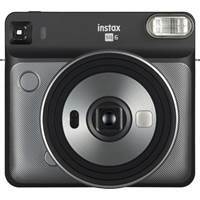 Overview: The Fujifilm Instax Square SQ6 instant camera can take photos and instantly produce 2.4" square, full color prints in approximately 90 seconds. The Instax Square SQ6 comes with a shoulder strap, and a two CR2 Lithium batteries. The camera is approximately 3-1/4"W x 6-11/16"H x 2-7/16"D and weighs 13.8 ounces. Instax Square Instant Film: The Instax Square SQ6 uses Instax Square instant film exclusively, which comes in packs of 10 sheets each. (No film is included with the camera). 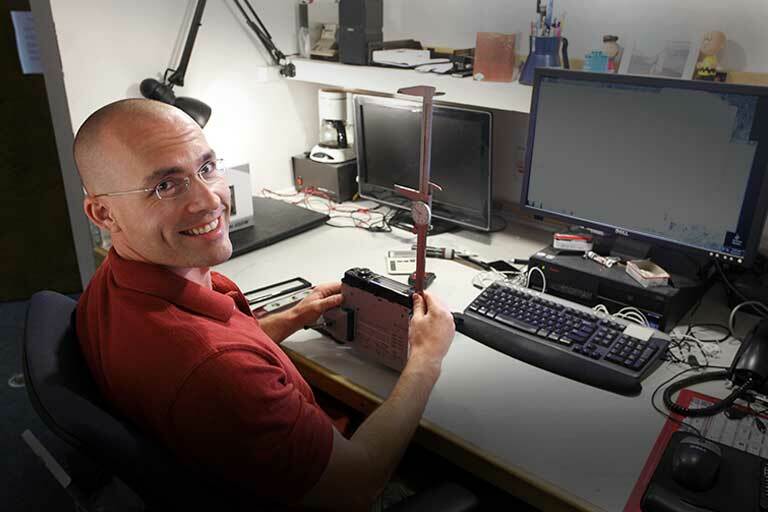 The camera can instantly produce full color photos on special paper that is 2.835" wide and 3.386" high. The image appears on the paper as a 2.4" square. Viewfinder: The camera has an Inverted Galilean viewfinder with a target spot. It has a 0.4x magnification factor to give you a representation of what the full photo will be. Automatic Exposure: The camera features automatic exposure control, with a range of LV5 to LV15.5 (ISO 800). The shutter speed automatically adjusts from 1/400 sec to 1.6 sec. When shooting at night or in dark rooms, the camera brightens both the subject and background. 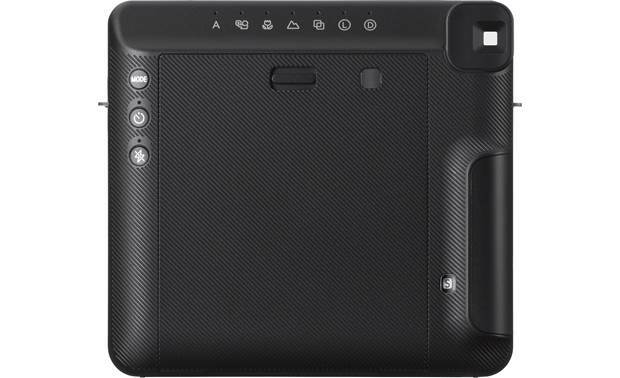 Built-in Flash: The Square SQ6 has a built-in flash with a range of 1 to 8.9 feet. The flash charges in 0.2 to 7 seconds with fresh batteries. The flash fires with every shot, unless you use the Flash Off mode. Three color flash filters (orange, green, and purple) are included to give your flash photos a special effect. Auto: Used for normal photography, the Auto Mode takes a single photograph without flash in bright light, or with automatic flash when lighting is low. You can turn off the flash, if desired. Selfie: The Selfie Mode is designed for taking self portraits while holding the camera at arms length, using the self portrait mirror (next to the lens opening) to frame your photo. The appropriate brightness and focus is applied when using this mode. Macro: The Macro Mode is for shooting closeups between 1 and 1.6 feet. The target mark in the viewfinder should be placed in the upper right of the center of the subject for proper framing. Landscape: The Landscape Mode should be selected when shooting distant subjects 6.6 feet and beyond. Double Exposure: Double Exposure Mode lets you combine two photos into one printed picture. Shooting a double exposure requires pressing the shutter button twice. Lighten: If your photos are coming out too dark, you can lighten them with this mode. Darken: If your photos are coming out too light, you can darken them with this mode. Self-Timer: The camera offers a self timer mode that delays the exposure 10-seconds after the shutter button is pressed, to allow the photographer to get into the picture, or to prevent camera shake. 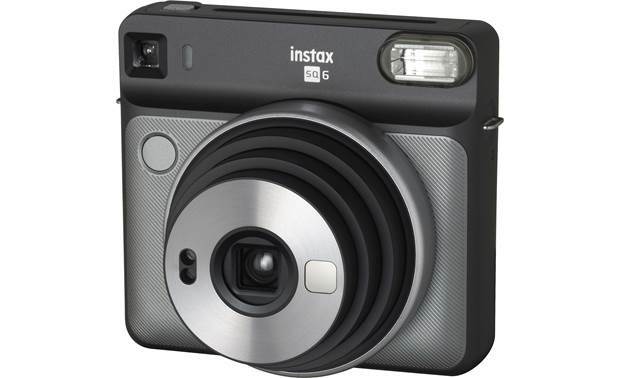 Power: The Instax Square SQ6 is powered by two 3-volt CR2 Lithium batteries (included). Fresh CR2 batteries provide enough battery power for approximately 30 Instax Square 10-pack film packs (300 shots). 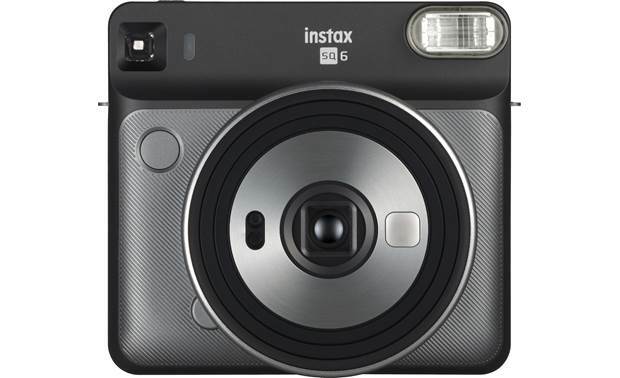 Instant Photo Printing: The Instax Square SQ6 prints a full color square print each time you take a picture. Each photo takes approximately 90 seconds to fully develop. Time varies depending on the ambient temperature. 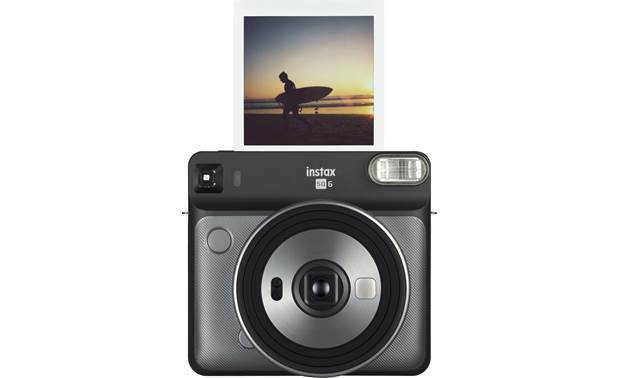 The camera uses Fujifilm Instax Square Instant Film (sold separately), which includes two packs of 10 sheets. 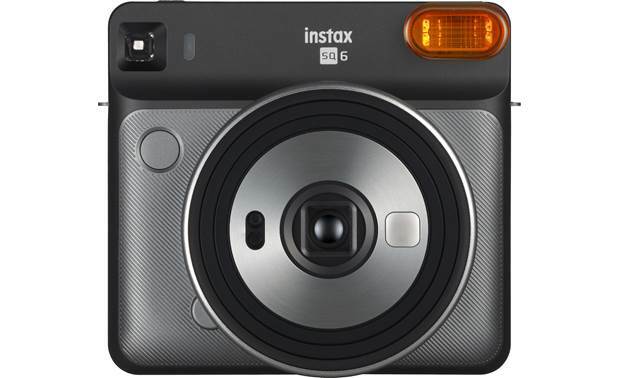 No film is included with the SQ6 instant camera.